Thank you for following me EPB. Your blog is lovely and whimsical. This entry was posted in public domain and tagged cats on April 28, 2013 by Peter Fleck. 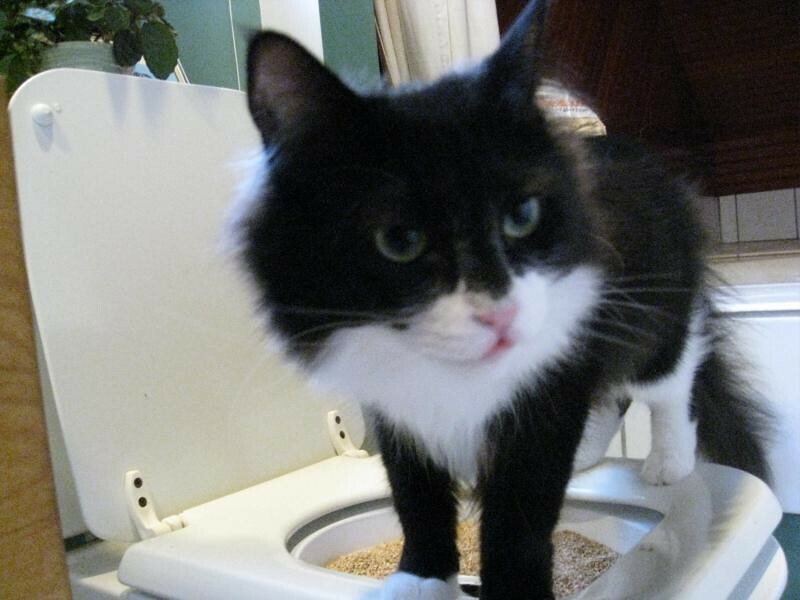 Back in August we started toilet training our cats with the CityKitty system. It’s gone pretty well and for the last several weeks, we’ve not had to deal with a litter box any more. It’s very nice. Except Dia, the white one, only likes to use the toilet for pooping when we are in the bathroom with her. (Peeing in the toilet is no problem, thank god.) This might have to do with the treats we gave them in training after they used the toilet. Whatever it is, her alternate spot is our bed. We’re not sure how we’re going to break this but we’ve covered the bed with an old shower curtain for now. This is still better than having to mess with a litter box. Things to remember: You have to leave the toilet seat down and the cover up. We put a strap around the toilet tank that holds the cover up or else I forget sometimes. I’ve got more photos up at Flickr. I hope to get a longer blog post on this soon. This entry was posted in Uncategorized and tagged cats on November 17, 2010 by Peter Fleck. This entry was posted in Uncategorized and tagged cats on April 1, 2010 by Peter Fleck.